Heat oven to 350°F. In medium bowl, mix crushed taco shells, 1 cup of the frozen corn, the cheese, chopped cilantro and onions. Open pork roast to lay flat; sprinkle with salt and pepper. Press taco shell mixture evenly onto pork to within about 3/4 inch of edge. Starting with one long side, tightly roll up pork jelly-roll fashion; tie with kitchen string at 1 1/2-inch intervals. Rub taco seasoning mix evenly over rolled pork. Place seam side down on rack in ungreased large heavy ovenproof roasting pan. Insert ovenproof meat thermometer so tip is in center of thickest part of pork. Roast uncovered 1 hour 15 minutes to 1 hour 30 minutes or until meat thermometer inserted into center of pork reads 155°F. Remove pork from pan; place on cutting board or serving platter. Cover with foil; let stand 10 minutes until thermometer reads 160°F. If necessary, drain off any excess fat from roasting pan; place pan over medium-high heat. Stir in garlic salt, cumin, broth and remaining 1 cup corn. Cook 2 to 3 minutes, stirring occasionally, just until corn is tender. Stir in lime peel, lime juice, tomatoes and avocado. Cook just until thoroughly heated. Remove string from pork; cut across grain into slices. 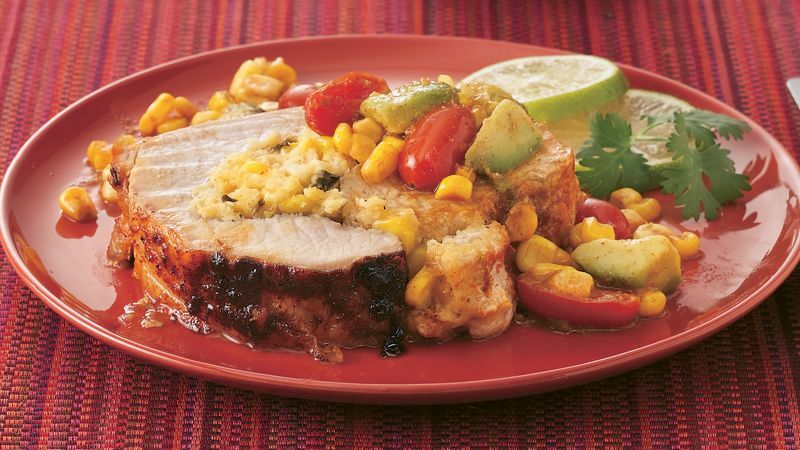 Serve pork with corn-avocado salsa; garnish with lime and cilantro. *To cut pork roast so it can be filled and rolled, cut horizontally down length of pork, about 1/2 inch from top of pork, to within 1/2 inch of opposite side; open flat. Turn pork so you can cut other side. Repeat with other side of pork, cutting from the inside edge to within 1/2 inch of outer edge; open flat. Sprinkle with salt and pepper. Fill and roll as directed above.